Mardi Gras is a great holiday to celebrate no matter your heritage. Just like on St. Patrick's Day everyone is Irish, on Mardi Gras everyone feels the spirit of Cajun revelry. Mardi Gras is a great day for crafters because it's all about dressing up and doing extravagant things. Here are some ideas for Mardi Gras crafts you can make at home. Make your own simple masks by drawing a mask shape on heavy paper or cardboard. Cut out the shape and make two eye holes. Decorate with glitter, sequins, buttons, ribbons, feathers, Mardi Gras beads, or anything else you would like. Attach a dowel to the side of the mask so you can hold it to your face, or attach a piece of elastic to the back to hold it on your head. 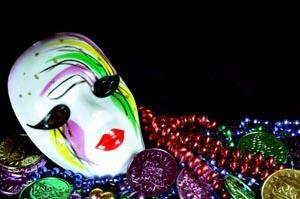 These masks make great party favors or decorations for a Mardi Gras theme party. You can also make crowns in much the same way by cutting out a crown-shaped piece of paper or cardboard, decorating and attaching a piece of elastic. The traditional desert of Marid Gras, as I mentioned earlier, is king cake. It's a doughy, yeasty cake with cream cheese icing decorated in the three Mardi Gras colors: purple (which stands for justice), green (faith) and gold (power). A bean, coin, pea or ceramic baby is baked into the cake. Tradition has it that the person who gets the "prize" has to throw the next party and bake the next king cake. If you want to try your hand at this crafty desert, check out this recipe. This is a fun one for the kids. Collect some old shoe boxes and turn them upside down. Pick a theme for your float (or your parade, if you're making lots of floats) such as a holiday, a country, a culture, a time period, a favorite sports team, or whatever you want. Cover the box with paper or foil and use you craft stash and small toys to decorate the "float" according to the theme. Each child can make their own float and then have a "parade" where everyone else can admire their work. These are fun centerpieces, too. This would be an excellent class project. This craft is also described in New Year's Eve Crafts, but it's a great idea for Mardi Gras, too. Take an empty paper towel roll and cover the outside with tissue paper (in Mardi Gras colors, of course). Fill the tube with confetti, candy and little treats like Mardi Gras doubloons and tie the ends with ribbon. The effect is not as dramatic as with store-bought poppers, but the prizes inside are better. Laissez les bons temps rouler! Mardi Gras only comes once a year, so make the most of it. These crafts are fun for kids and adults, so gather your family together, try a few of these projects, and let the good times roll!